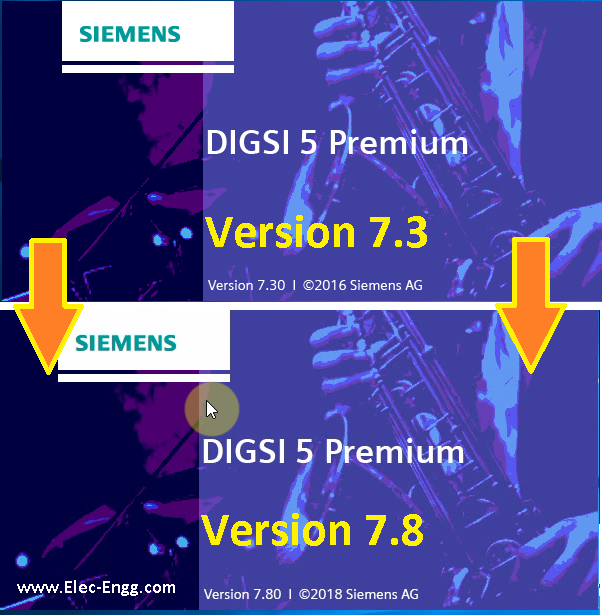 The following Pictures and video show how to upgrade form the older version of DIGSI to a newer version. Before installing the newer version, we have opened the DIGSI 5 Software to check the DIGSI 5 License and DIGSI 5 version. 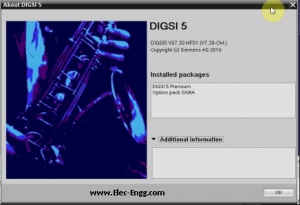 The installed package is DIGSI 5 Version 7.3 with DIGSI 5 Premium License with SIGRA software. Before you install the latest DIGSI 5 versoion, consider exporting the IEC 61850 station description (SCD) from your projects created with DIGSI 5. 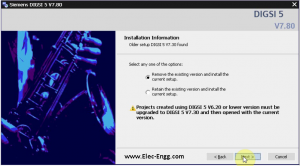 When you convert your Projects to the DIGSI 5 version you are about to install, you wil need this file in order to preserve the IEC 61850 configuration part of a project. 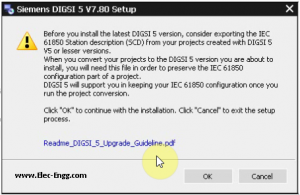 Digsi 5 will support you in keeping your IEC 61850 configuration once you run the project conversion. 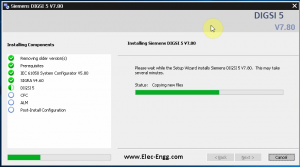 The setup wizard wil install Siemens DIGSI 5 V7.80 on your computer. DIGSI 5 standard and DIGSI 5 Premium require the installation of a proper license key at the first startup of DIGSI 5. DIGSI 5 compact works without any license key installed. It is also possible to start a 30 day trial period for testing DIGSI 5 Premium after installation. It is better to install DIGSI in the default folder. 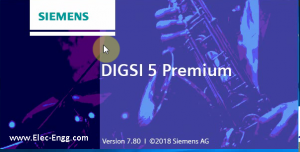 So, just click the Next to install Siemens DIGSI 5 v 7.8 to the default folder. 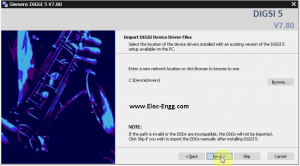 In this step, it is asked to enter a path of the device drivers installed with an existing version of the DIGSI 5 setup available on the PC. It is better to skip this step and import the digsi 5 device manuals after installing DIGSI 5. 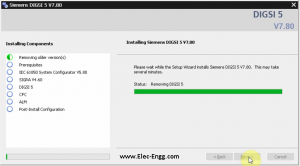 The installing Siemens DIGSI 5 V7.8 is start. It takes time to Removing the older version of DIGSI 5, installing DIGSI 5 Prerequisites, installing the IEC 61850 system configurator, SIGRA, DIGSI 5, CFC, Automation License manager and the post DIGSI 5 configuration. During installation of DIGSI 5, it will ask to restart the system. 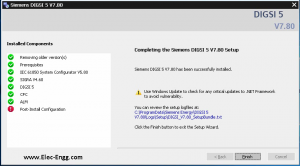 For the configuration changes made to Siemens DIGSI V7.8 to take effective, we have to restart the PC. Therefore, click the Restart Now. 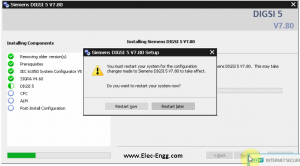 After system restart, the DIGSI 5 installation will continue automatically. At the end, a window shows the completing the DIGSI Siemens DIGSI 5 V7.8 setup. It is shown that the Siemens Digsi 5 V7.8 has been successfully installed. The alert also shown that windows updates for the update of .Net Framwork is suggested Click finish. 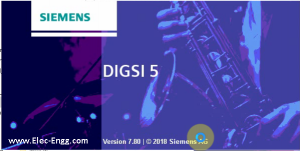 Now open DIGSI 5 Software to check the DIGSI 5 License and DIGSI 5 version. 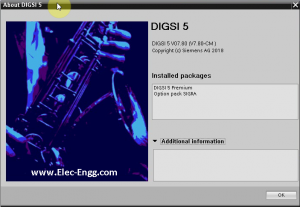 The installed package is DIGSI 5 Version 7.8 with DIGSI 5 Premium License with SIGRA software.